This is the second in my 30 in 30 by 30 series, wherein I undertake 30 adventures before I turn 30 years old on Aug. 6. 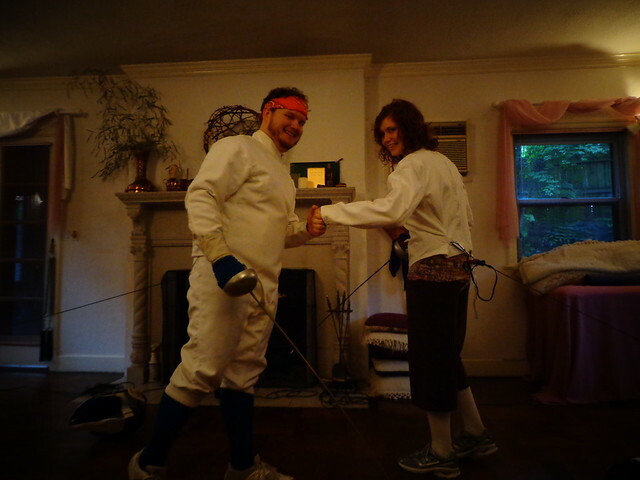 Anyway, my incredibly awesome brother-in-law Alex taught me how to fence today! Okay, to be honest, he gave me a spectacular lesson in fencing basics and I pretty much just played dress-up and stabbed things. Reach out and score a touch. He had all the gear, even an electronic scoring thingy that he borrowed from the Northern Kentucky Fencing Academy (NKFA). Alex fences every week with the NKFA and teaches third graders epee basics, so he was pretty well prepared for my level of maturity. When you watch someone fence, it looks almost effortless and natural, like a dance that would be easy to pick up. That "effortlessness" represents hours of practice and I the more I learned about the sport, the more I understood how little I knew about it. In other news, none of my limbs knows what any of the others are doing at any given time. I'm never physically aggressive (though my sister may disagree) so it was a little unsettling to have Alex stand back and invite me to poke him with an epee. It was perturbing but awesome. 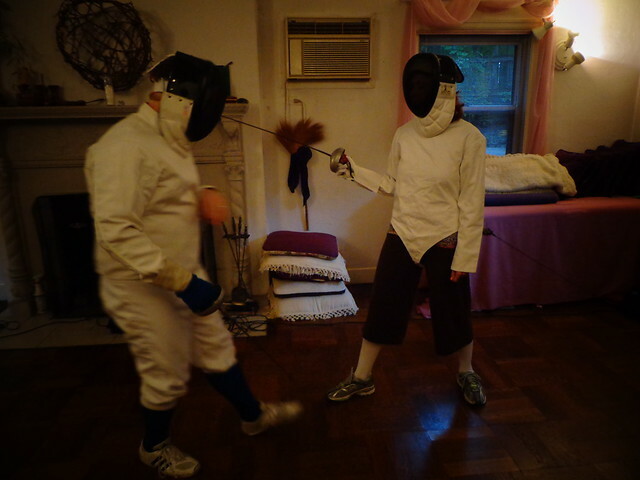 With the layers of gear to prevent stab-related injuries, fencing is a sweaty business. 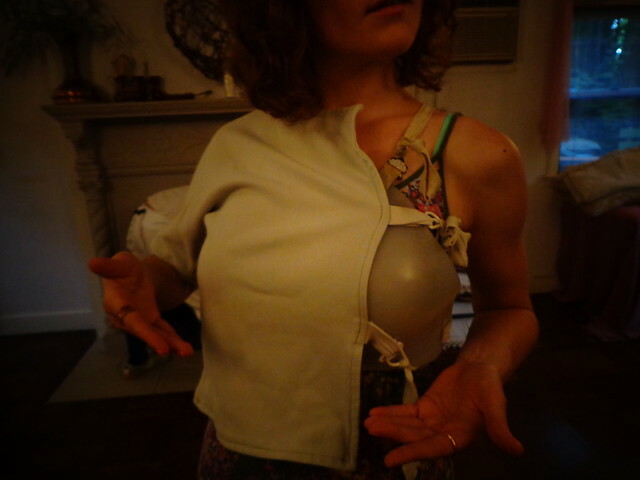 After about an hour of perspiring into my plastron, I was pooped. I may actually fence again. I like the balance of yoga-like postures with the violence of attempting to puncture people. 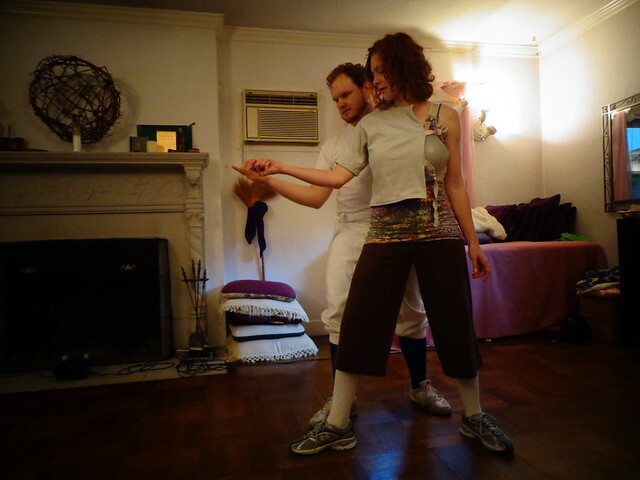 A thousand thanks to Alex, the NKFA and to Fanchon Shur, who allowed us to swing weapons around in her dance studio. Tomorrow's adventure: The Vent Haven Museum! I think this needs more comments!